Israel In Prophecy » KeyIssues/Are Jews are more acceptable to Him than Palestinian Arabs?? Are Jews are more acceptable to Him than Palestinian Arabs? 33 "'When an alien lives with you in your land, do not mistreat him. 34 The alien living with you must be treated as one of your native-born. Love him as yourself, for you were aliens in Egypt. I am the LORD your God. 7 "'When any Israelite or any alien living in Israel separates himself from me and sets up idols in his heart and puts a wicked stumbling block before his face and then goes to a prophet to inquire of me, I the LORD will answer him myself. 8 I will set my face against that man and make him an example and a byword. I will cut him off from my people. Then you will know that I am the LORD. Many people harshly criticize the Jews for mistreating the Palestinian. However, Scripture tells us that foreigners must fulfill certain God ordained conditions if they want to coexist peacefully with the Jews in the land. 18 He defends the cause of the fatherless and the widow, and loves the alien, giving him food and clothing. 19 And you are to love those who are aliens, for you yourselves were aliens in Egypt. Our Conclusion: Since God in his perfect righteousness shows no partiality, and in his grace loves Jews and Arab alike, they are both promised a future and a hope. 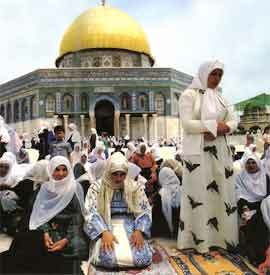 The Arabs will join themselves to the Jews to worship the God of Israel. The Arabs are even allowed to live in the land of the Jews if they fulfill the conditions for foreigners. Having your homes, shops, and churches bruned, can't get a job-if there were any- because muslims won't hire Christians, children kidnapped and raped all with the police refusing to do anything is not a conspiracy by Christians. Their reaction is about survival. 100,000 left? That leaves 8 million who can't leave. Read your history of islam. Christians are worried about dying at the hands of state sanctioned mobs. Having your homes, shops, and churches bnured, can't get a job-if there were any- because muslims won't hire Christians, children kidnapped and raped all with the police refusing to do anything is not a conspiracy by Christians. Their reaction is about survival. 100,000 left? That leaves 8 million who can't leave. Read your history of islam. Christians are worried about dying at the hands of state sanctioned mobs.